Money, miles, and home time are the undisputed ‘big 3’ of truck driver recruiting. Everybody cares about those things. But drivers have plenty of other questions, concerns, expectations, and aspirations that factor into whether or not they apply. Parking, hours of service, life on the road, benefits, perks, industry regulations, the future of trucking … these are just a few considerations drivers weigh when looking for a new gig. Utilizing content marketing to address potential pain points (or selling points) is a great way to proactively alleviate concerns, answer questions, and smooth the recruiting process. Here are some examples of issues worth getting out in front of, and topics that’d merit content coverage. As you well know, parking is a constant headache and a major safety issue for truckers. It’s been eight years since Jason’s Law was enacted, yet access to safe, convenient parking continues to be serious concern. How does your fleet mitigate parking-related hassles for your drivers? Have you been proactive in this area? This is a good topic to cover in your recruiting content to alleviate concerns. There are plenty of truck parking apps, maps, and recaps out there for you to lap up, tap into, and wrap your head around. How can you springboard off of existing content to use for your own purposes? You might consider compiling helpful parking-related resources into a handy one-sheeter, or ‘top 10’ blog post list. As you add resources over time (when new apps, articles, or resources appear), that’s an evergreen, evolving piece of content you can share regularly on social media. You might have heard about a new president being elected. I’m not sure, I haven’t really seen much about it online or on social media. It remains to be seen how the Trump administration will handle the trucking industry regulations set in place during the Obama years. Of particular importance for drivers are rules dictating hours of service, CSA scores, driver training standards, and ELD mandates. But of course this is all subject to change. President Trump just ‘ordered agencies to freeze new regulations.’ We don’t know what the fate of the new entry-level driver standards will be. As regulations change, this developing situation offers a prime opportunity for fleets to be at the forefront of industry-altering shifts. 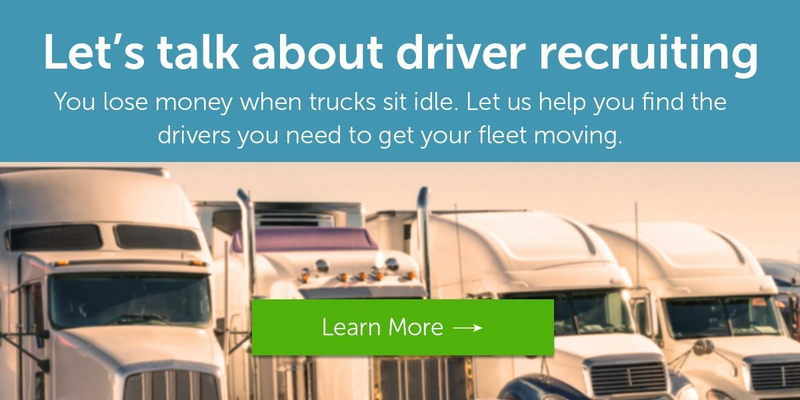 Keeping abreast of trucking-centric news sources like CCJ, Overdrive, and Truckers News will keep you informed and up to speed, and give you fodder to spur your own messaging. It doesn’t have to be anything fancy; sometimes just a post on social media will do. Staying on top of rule changes in legislation demonstrates a measure of engagement, authority, thoughtfulness, and awareness. We can’t do much about all the uncertainty swirling around, but showing a concerted effort to keep up with laws that affect drivers’ lives is good for recruiting. For the foreseeable future, driving a truck still offers a solid way to make a living. Don’t be afraid to tackle tough issues in your content marketing. Drivers are no doubt aware of automation, and understandably leery of robots stealing jobs. But for now, you can embrace and tout the positives of tech in your messaging, and use emerging technologies to attract and retain younger drivers. Video, which is taking over the world right now, is a no-brainer here. Shoot videos of your fleet’s tech in action, and share away on social media. Don’t have a videographer? No problem! Ask your drivers for to shoot quick videos on their smartphones on their downtime. We’re all content creators now. It’s no secret that the trucking lifestyle is hard on the body. Eleven stressful yet sedentary hours a day in a seat takes its toll on drivers. Which, in turn, takes a toll on your fleet. What can you do to attract drivers with fitness-centric benefits? What sorts of health-related perks can you come up with? Do you provide any practical trucker-centric healthy living tips? Take a look around the trucking landscape to see what others are doing, and incorporate what you can from wellness sites geared toward truckers. Ask your drivers what they’d like to see in a wellness plan, and promote new perks on your website and social media channels. Learn as much as you can about your drivers’ daily challenges, and arrange your content marketing to address those matters accordingly. Create food- and exercise-related cheat sheets drivers can take on the road. Addressing these issues in your messaging up front can elevate your profile, advance your thought leadership, and help you attract more drivers. You’re well on your way to more crafting content that drives effective recruiting and retention!